We are "RENTACAN　NARITA International Airport ",that rental Campervan,Camping car,Motorhome,RV company located in Chiba prefecture, close to the Narita International Airport.You can enjoy and natural beauty in Japan as a camper journy.We're waiting for your booking . As the name Shinjuku Gyoen is a vast garden in the middle of the city in Shinjuku Ward It is a famous sightseeing spot in Tokyo which can be said as big nature in the city = oasis It is a place of relaxation for Tokyo citizens Shinjuku Gyoen 's garden consists of three types of gardens, a French style molding garden, a British landscape garden and a Japanese garden, so every landscape is beautiful and impressed. 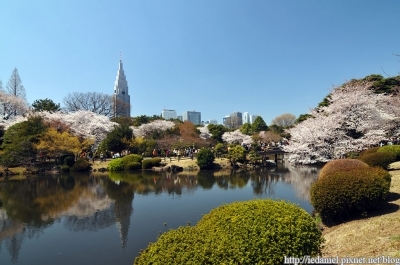 The Shinjuku Gyoen includes old-style Western-style holiday houses in the UK landscape garden, Old tea room in the Japanese garden, There are many historical buildings and you can catch a glimpse of Japanese history. 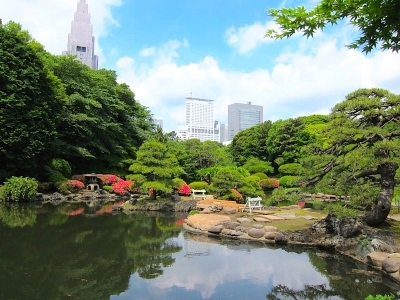 In addition, there are various flowers in the garden and you can enjoy the views of the seasons. Spring starts with cherry blossoms and plums, flowers and autumnal leaves such as hydrangea in the summer, colored flowers in the autumn, fly cake in the winter You can enjoy plentiful plants besides representative flowers such as flowers. Shinjuku Gyoen closes Mondays and New Years and New Years every week, and it opens everything else. The fee is also conscientious, adults are 200 yen, dwarfs are 50 yen, infants are free. There are restaurants and cafés, and there is a rest space, so you can eat what you bought at a shop You can also. The souvenir corner is also popular and I think that you can buy souvenirs in Tokyo here. Because there is Kujukurihama Seaside Auto Campground on the way from Narita Airport, After enjoying a convenient camper after enjoying the sea, I think that it is good to enjoy sightseeing in Tokyo. 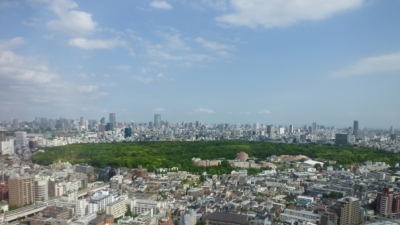 I would like you to visit Shinjuku Gyoen in order to be a wonderful sightseeing in Tokyo.